Texting and driving might be bad, but have you ever tried riding a bike through traffic, whilst trying to read Google Maps and texting your girlfriend? You'll probably end up with a wing mirror in the kidneys, if you're lucky. Thankfully, Kickstarter is On The Case. The COBI system wants to be a one-stop shop for everything bolted to your handlebars. To that end, it's offering two main features: illumination, and integration with your smartphone. The lights are pretty good on their own: a bright LED front light, and a rear light that indicates when you're braking and turning. But the smartphone integration is what could make this more than just an overpriced set of lights. 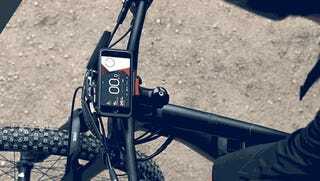 When you're riding, the waterproof mount for your phone (allegedly iOS and Android compatible — presumably it's device-specific) and the app let you monitor weather, gives directions and music controls, all while charging your handset from the included 6000mAh battery. When you detach the phone and move out of Bluetooth range, the same mount uses an internal accelerometer to act like a car alarm — basically, making a lot of noise if anyone tries to move it. You can also add on accessories like a thumb controller, which communicate over Bluetooth.